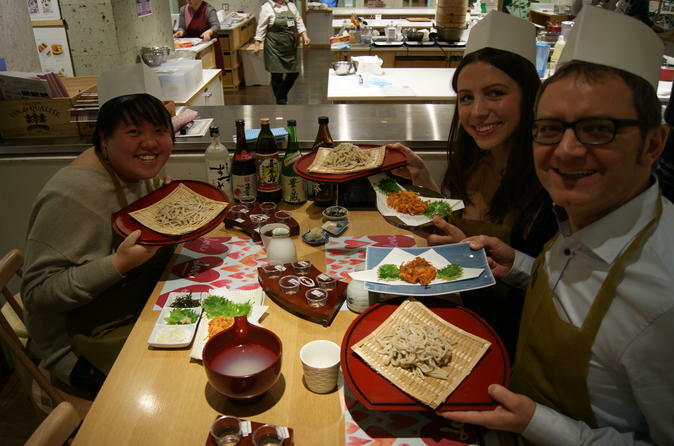 In this tour you can experience, is to wear prepared apron and chef hat, and make your own soba noodle with professional soba chef in Tokyo. Enjoy making and eating soba noodle in Tokyo! Soba is one of the most traditional types of Japanese meal. Soba, made from buckwheat flour, is eaten casually or on special occasions such as new year ceremony. The process of making soba noodle looks simple but you will see it is very sensitive process. and all necessary equipments and you will create from a foundation of Soba. Also, pre-cooked Tempura will be also served for you. If you can get buckwheat flour in your country, you will became soba chef after you go back to your home. Why don't you make soba noodle in your home.